A PRE-HISTORIC elephant has revealed clues of what life was like for early humans and how it met its end. University of Southampton lecturer and archaeologist Dr Francis Wenban-Smith discovered remains and has spent the last ten years studying the creature. Now he has published a book that will teach other archaeologists about life for people that existed thousands of years before Neanderthals. The extinct straight-tusked elephant was found in Ebbsfleet in Kent, below, while construction workers were preparing the build the High Speed 1 rail link between the Channel Tunnel and London. The species was twice the size of today’s African elephant and almost four times the weight of a family car. The 420,000-year-old remains were buried along with other creatures, including prehistoric ancestors to cattle and extinct forms of rhinoceros and lions. 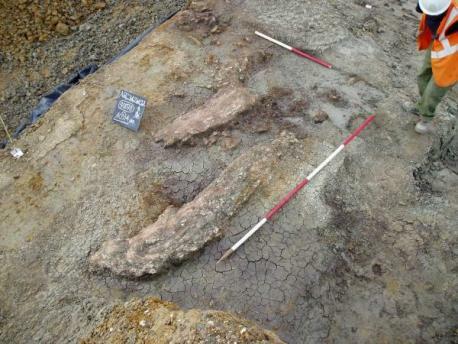 It was also found surrounded by flint tools used to cut meat from carcasses, which have lead Dr Wenban-Smith to believe early humans may have eaten and possibly hunted the creature in a group. Dr Wenban-Smith, pictured below, said: “The key evidence for elephant hunting is that, of the few prehistoric butchered elephant carcasses that have been found across Europe, they are almost all large males in their prime, a pattern that does not suggest natural death and scavenging. “Although it seems incredible that they could have killed such an animal, it must have been possible with wooden spears. “Rich fossilised remains surrounding the elephant skeleton, including pollen, snails and a wide variety of vertebrates, provide a remarkable record of the climate and environment the early humans inhabited. 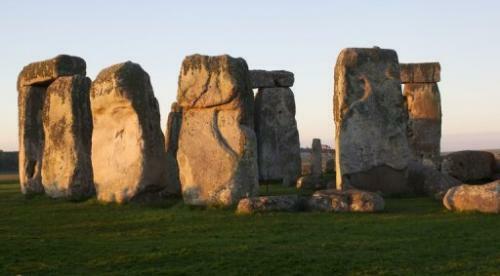 THE workforce that built Stonehenge 4,500 years ago came in their thousands from the length and breadth of Britain, a study shows. The massive stone circle was erected over a decade by people attending the equivalent of “Glastonbury festival and a motorway building scheme at the same time”, says Professor Mike Parker Pearson, from University College London. Analysis of a nearby Wiltshire settlement suggests 4,000 people at once would have gathered at the site when Britain’s then population was only tens of thousands. Cattle and pig teeth show people travelled from as far away as the Scottish Highlands. Prof Parker Pearson said construction of the monument was “not all fun, there’s work too”. The people who built Stonehenge 5000 years ago probably had the same pallid complexion of many modern inhabitants of the UK. Now it seems that the humans occupying Britain and mainland Europe only lost the darker skins of their African ancestors perhaps just 6000 years earlier, long after Neanderthals had died out. The finding confirms that modern Europeans didn’t gain their pale skin from Neanderthals – adding to evidence suggesting that European Homo sapiens and Neanderthals generally kept their relationships strictly platonic. There is a clear correlation between latitude and skin pigmentation: peoples that have spent an extended period of time at higher latitudes have adapted to those conditions by losing the skin pigmentation that is common at lower latitudes, says Sandra Beleza at the University of Porto in Portugal. Lighter skin can generate more vitamin D from sunlight than darker skin, making the adaptation an important one for humans who wandered away from equatorial regions. Those wanderings took modern humans into Europe around 45,000 years ago – but exactly when the European skin adapted to local conditions had been unclear. Beleza and her colleagues studied three genes associated with lighter skin pigmentation. Although the genes are found in all human populations, they are far more common in Europe than in Africa, and explain a significant portion of the skin-colour differences between European and west African populations. By analysing the genomes of 50 people with European ancestry and 70 people with sub-Saharan African ancestry, Beleza’s team could estimate when the three genes – and pale skin – first became widespread in European populations. The result suggested that the three genes associated with paler skin swept through the European population only 11,000 to 19,000 years ago. “The selective sweeps for favoured European [versions of the three genes] started well after the first migrations of modern humans into Europe,” says Beleza. The finding agrees with earlier studies suggesting that modern humans did not lose their dark skins immediately on reaching Europe, says Katerina Harvati at the University of Tübingen in Germany. “[The new study] is interesting because it suggests a very late differentiation of skin pigmentation among modern humans,” she says. An earlier analysis of ancient DNA in 40,000 and 50,000-year-old Neanderthal bones, respectively from Spain and Italy, suggested that our extinct cousins had light-coloured skin and reddish hair in their European heartland. 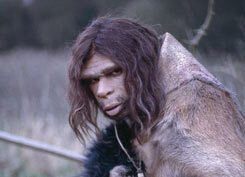 But the Neanderthals went extinct around 28,000 years ago – long before modern humans in Europe gained a pale skin. Evidently Neanderthals did not pass these useful local adaptations on to modern humans, despite genetic evidence that the two species interbred. That might seem unusual given that the two species lived cheek-by-jowl in Europe for several thousand years. But it makes sense if the interbreeding evident in the genes occurred in the Middle East, where modern humans and Neanderthals first met, says Chris Stringer at the Natural History Museum, London. In that region, Neanderthals may have had darker skins, explaining why our species did not gain a pale skin after interbreeding with them. Indeed, a study earlier this year of ancient DNA suggested that Neanderthals living in what is now Croatia had dark skin and brown hair. “Neanderthal skin colour was probably variable, as might be expected for a large population spread out over a large territorial expanse,” says Harvati. he Dover Boat is one of Britain’s great under-appreciated ancient artefacts. Older than the Roman Empire. Older than Moses. 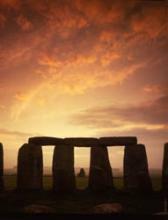 It would have been in the water at the same time Stonehenge was in use. That’s about 1500 BC – 3,500 years ago. There would have been countless others like it of course but they have not survived. Built from planks of oak, stiched together with pieces of yew. Certainly not meant to last thousands of years, which is why the vast majority have disappeared. So to have found one – or at least seventy per cent of one – and to have preserved and displayed it is nothing short of miraculous. There are boats or fragments of boats which may well be older; the Abydos fleet of Egypt for example or the pine canoes of China’s Zhejiang province. And wood found off the Hampshire coast at Hayling Island in the late 1990s has been carbon dated to 7,000 years ago. What makes Dover’s boat special though is that so much of it can still be seen and appreciated thanks to a huge rescue and conservation effort. When it was first discovered during roadworks in Dover town centre it stunned archaeologists. But every hour the timbers were exposed it was effectively rotting away. And so teams of historians and archaeologists swung into action by the roadside. 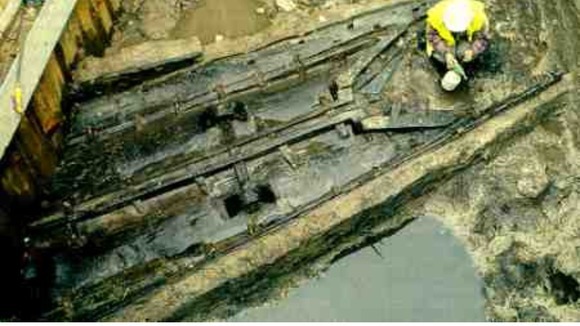 The boat was cut into sections, measured, recorded and cleaned. The bits were taken to a shed in Dover Harbour where they were kept wet in large and hastily-constructed water tanks. Later the ancient wood was strengthened using liquid wax, freeze-dried at the Mary Rose Trust in Portsmouth and finally put back together using an adjustable crane. 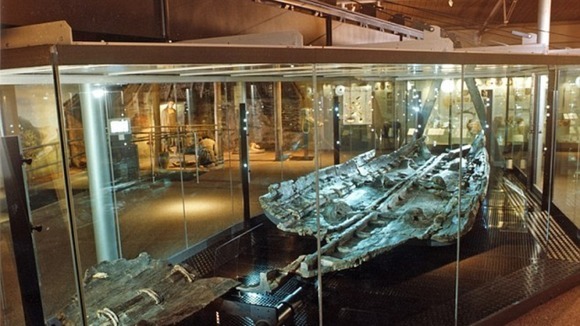 The Dover Boat is one of Britain’s great under-appreciated ancient artefacts. Then came another battle – to keep the Dover Boat where it belonged. A world-famous museum was said to have bid for it but had the idea of keeping it in pieces. In the end there was a massive fund-raising initiative and a great gallery was built in Dover Museum with a sealed glass chamber that now keeps the precious object safe in perpetuity. And all the time historians have been looking at it, examining it, working out how it was built. Seeing how it would have been hewn from the timbers of mighty trees that would have grown all the way down to the shoreline back then. Seeing how it would not have had a sail, perhaps not even a rudder. Difficult to tell because the back of the boat is missing. Seeing how it would have been rowed by about a dozen men using huge oars. Maybe they wave-tested it off the Kent coast. Maybe it pootled upriver. Debate has raged over whether the Dover Boat was robust enough to have taken to the seas and therefore establish a claim to be one of the world’s oldest surviving seagoing vessels. It or something like it would surely have rowed along the coast of Southern Britain, hugging the coastline in case it shipped too much water. How can we say that? What evidence do we have to back this up? Well there are artefacts found in Dover from this time period from as far away as Dorset. Logical to think of them having been brought by sea rather than carried overland in what would have been a cumbersome and time-consuming journey. And so above and beyond all the theories about why and how our boat was built emerges a tantalising possibility. That it was put together by people who did not just have skills passed down over a few generations, but boat-building knowledge accrued in their communities over hundreds if not thousands of years. That something very similar to our rickety-looking, oak-planked, yew-stitched craft was crossing the English Channel and also the oceans way back in Stone Age times. Imagine what light that would cast on our knowledge of the spread and dispersment of peoples, societies, cultures, even entire civilisations, in that yawning chasm of time before recorded history. The Dover Boat is that significant. A rare treasure. recent years in a bank vault. The Wiltshire Heritage Museum in Devizes, which had been at risk of closure, has been awarded a £370,000 lottery grant to create a new gallery. The new Prehistoric Galleries will display Wiltshire’s gold and amber finds dating back to before 2,000 BC. Museum director David Dawson said he was “absolutely delighted”. 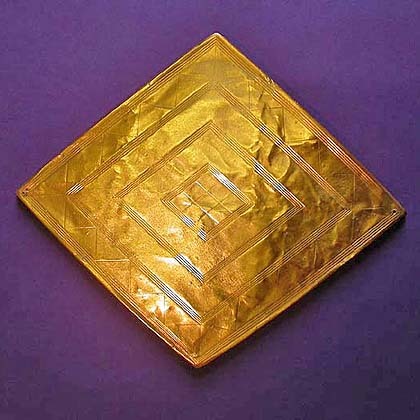 “The best thing is we’ve got completely unique gold items from the time of Stonehenge and we’ve been able to put those on display for the first time in generations,” he said. “It was excavated almost 200 years ago but it’s been buried away in bank vaults for the last few generations – simply because we’ve not been able to display it. The museum currently receives a grant of £35,500 per year from Wiltshire Council. But last month, the council rejected the museum’s request to increase its grant despite the trustees claiming it could run out of cash within two years. Negley Harte, the museum chairman, said the new gallery would be “vital for the future sustainability of the museum”. Around 8,000 years ago, prehistoric hunters killed an aurochs and their grilling techniques were frozen in time. 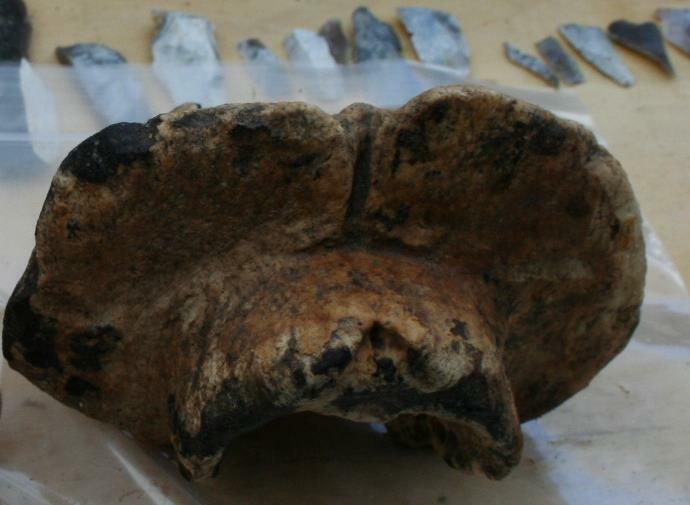 Remains of a butchered and cooked female aurochs (a prehistoric cow) have been identified from a Stone Age Netherlands site. The hunters appear to have cooked the meat over an open fire, eating the bone marrow first and then the ribs. Stone Age barbecue consumers first went for the bone marrow and then for the ribs, suggest the leftovers of an outdoor 7,700-year-old meaty feast described in the July issue of the Journal of Archaeological Science. The remains, found in the valley of the River Tjonger, Netherlands, provide direct evidence for a prehistoric hunting, butchering, cooking and feasting event. The meal occurred more than 1,000 years before the first farmers with domestic cattle arrived in the region. Although basic BBQ technology hasn’t changed much over the millennia, this prehistoric meal centered around the flesh of an aurochs, a wild Eurasian ox that was larger than today’s cows. It sported distinctive curved horns. Another big difference is how meat was obtained then. “The animal was either caught in a pitfall trap and then clubbed on the head, or shot with a bow and arrow with flint point,” co-author Wietske Prummel, an associate professor of archaeozoology at the University of Groningen, told Discovery News. Prummel and colleague Marcel Niekus pieced together what happened by studying an unearthed flint blade found near aurochs bones. These show that after the female aurochs was killed, hunters cut its legs off and sucked out the marrow. According to the study, the individuals skinned the animal and butchered it, reserving the skin and large hunks of meat for carrying back to a nearby settlement. Chop marks left behind by the flint blade show how the meat was meticulously separated from the bones and removed. Burn marks reveal that the hunters cooked the meaty ribs, and probably other smaller parts, over an open fire. They ate them right at the site, “their reward for the successful kill,” Prummel said. The blade, perhaps worn down from so much cutting, was left behind and wound up slightly scorched in the cooking fire. The researchers suspect these people lived in large settlements and frequented the Tjonger location for aurochs hunting. After the Iron Age, the area was only sparsely inhabited — probably due to the region becoming temporarily waterlogged — until the Late Medieval period. Aurochs must have been good eats for Stone Age human meat lovers, since other prehistoric evidence also points to hunting, butchering and feasting on these animals. A few German sites have yielded aurochs bones next to flint tool artifacts. Aurochs bones have also been excavated at early dwellings throughout Europe. Bones for red deer, roe deer, wild boar and elk were even more common, perhaps because the aurochs was such a large, imposing animal and the hunters weren’t always successful at killing it. At a Mesolithic site in Onnarp, Sweden, for example, scientists found the remains of aurochs that had been shot with arrows. The wounded animals escaped their pursuers before later dying in a swamp. The aurochs couldn’t escape extinction, though. The last aurochs died in 1627 at a zoo in Poland.